Oh, sweet girl. Come here and sit with me for a minute. Right here, this chair has room for two. Rest your head. Let me wrap you in my arms. Close your eyes. Take a breath. Now another. Let it go. Let the tears fall. Relax your shoulders. Relax your face. Let your heart unwind, just for this moment. You’d like to tell you it’s just a matter of time, and then you’ll get over her and she’ll cease to occupy this space in your mind, in your heart, in your life. And that might be true. It really might. But there are some people we never really get over. It does get better, or at least it gets different. But there are certain loves that remain with us always. Places that ache for the things we left behind, all that won’t ever be ours again. And it ebbs and flows and changes and sometimes it helps to accept that some love really is eternal. As for your girl, the one who has your heart, nobody can tell you to stop loving her. And you cannot tell yourself to stop loving her. The heart loves what it loves. It cannot always have what it wants, but it loves what it loves. See if you can’t hold that close and steady and dance with it for a while until the ease finds you. Yes, you love her. Yes, you might always love her. And no, you can’t have her. Not right now and maybe not ever again. These things are all true and real and solid. And there’s a sweet spot somewhere in the center of those truths where you can find peace. That does not mean it won’t hurt and you won’t long and ache and cry for what you’ve lost. No, it doesn’t mean you can turn your back on the very real grief that lives inside of you. But if you find your way to living in that sweet spot – between grief and acceptance – welcoming the ache but not nurturing it, holding the angst but not feeding it – you’ll come to a different place. A place where you can find the path of opening your heart to another, or better yet – to yourself. To be your own lover, in all the ways that you can be. To be exceedingly kind to your heart, and your soul and your body and your spirit. To know and hold all the ways and people and things that you love, all the loves that feed and sustain you. To recognize what is toxic to you without judgment, to set aside what does not serve. To know you can love, deep and long and hard and true, and still walk away to save yourself. These are all tremendously difficult things. But worthwhile. Necessary. 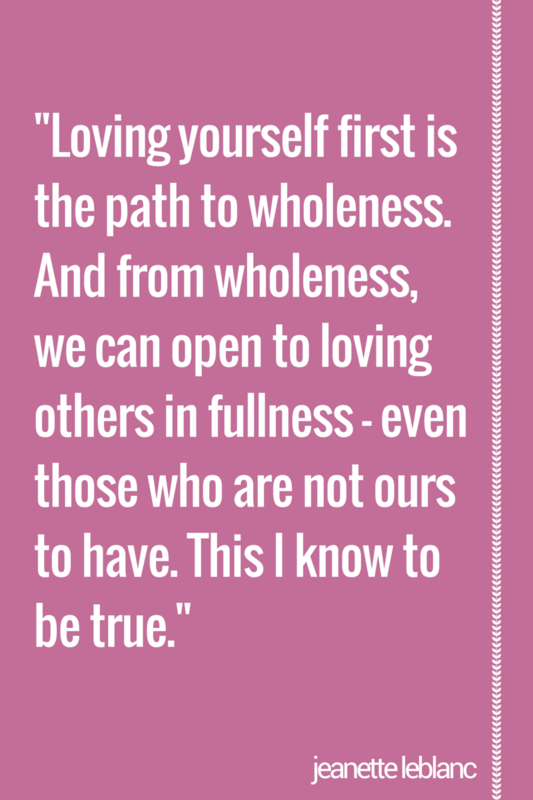 Loving yourself first is the path to wholeness. And from wholeness, we can open to loving others in fullness – even those who are not ours to have. This I know to be true. And that this is good. You are good. And yes, even this love you still have for her, it is good. Trust in your longing. Even the part that longs for her. Because that is a longing for her, but also a longing for love. For that spirit or energy or spark that you shared that is about her, but not really about her at all. It is it’s own thing, and it exists in many different ways inside of many different people you will meet. And it will not be the same – no – it will be infinitely, excitingly, thrillingly different each time. So let the floor fall out from under you. Nothing big ever happens, good or bad, unless the floor falls out first. Let your longing wind you down through that spiral. And know that falling can be the most wickedly awesome and totally safe thing you’ve ever done. Down, down, down – and when you hit that solid ground you’ll know. And you might touch down softly, or you might land in an ungraceful thud. But land you will. And your heart will still love what it loves. And you will remember that was good in you, and in her. And these memories will comfort and will serve you as you move through life, open to love – wherever and whenever it finds you.